Once your commercial landscape is installed, there are few things more important than keeping the grounds hydrated and healthy. But doing that manually takes a lot of time, labor and effort — and that’s where an automated irrigation system comes in. GreenEarth Landscape Services’ irrigation experts will survey your commercial property and create a plan for installing a fully automated irrigation system on your property. And we’ll be by your side for all your commercial irrigation service needs, too, from preparing your system for the hottest summer months to regular service checks. As part of our full spectrum of commercial irrigation services, we’ll perform regular audits of your property’s irrigation system — inspect the piping, pumps, sprinkler heads, system components and more — and provide you with a breakdown of what we find during each inspection. But we at GreenEarth also realize that other, more urgent problems can arise in irrigation systems that can affect your business and require immediate attention. That’s why we’re always on call, to address those emergencies and ensure that your system is always in top shape, so your commercial property’s landscape is as problem free as your business operations. 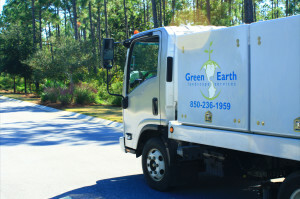 GreenEarth serves commercial properties in Panama City Beach, Panama City, Lynn Haven, Santa Rosa Beach, Destin, Sandestin and Mirimar Beach, Florida. Ready to discuss your commercial irrigation needs? You can reach our Panama City Beach office at (850) 236-1959 or our Santa Rosa Beach office at (850) 267-0010. Or, you can fill out our handy online form to schedule a free consultation.